It doesn’t matter how the road is traveled. As long as you reach the destination. Every Thursday I sing karaoke. I go up to the mic and belt out some rendition of Aretha or Whitney. I think I do these songs pretty well. You see, I am a professional. I sing for a living. I have a Bachelor of Fine Arts in Vocal Performance from Carnegie Mellon and I get paid to do what I do. Really, I SHOULD sing these songs well. It’s my job. Now, Joe Schmo heads up to that same microphone to sing a little Jimmy Buffett. He doesn’t want to be the next American Idol. He just wants to go up, beer in hand, and try his luck at “Margaritaville”. He wants to have fun. Does that make him any less worthy of getting up there? Does that make his effort any less admirable? Though he may grace his notes with a little less pizzazz, does he not have every right to get up there and sing his tune? Karaoke is, after all, designed for everyone to try. Not everyone succeeds. Some do at higher levels than others, but the challenge still remains. And if the challenge is taken seriously, how can you not respect that? Last week I wrote an entry entitled, “Mass Mentoring. Why I Run. 16 Miles.” In it I describe how inspired I’ve been by the Mass Mentoring Partnership and how much I enjoy running to help children in need. The comment (above) was left by “Nick” in response to this blog. The sad part is, there are many people like Nick who believe charity runners are a disgrace to the marathon community because a lot of us don’t “qualify.” The truth is, there are MANY charity runners who are some of the most athletic people I have ever encountered. They choose to run for charity. They choose to do good. True. 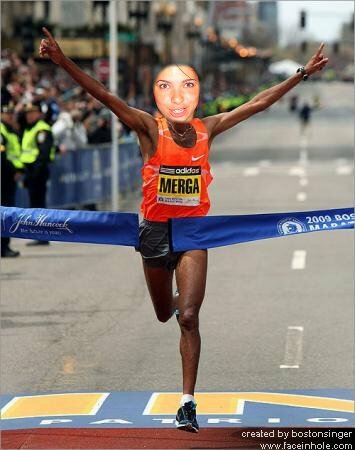 I did not qualify for the Boston Marathon. It would be nice to achieve that some day, but I can’t begin to pretend that I am near that level of fitness right now. Nick’s blatant level of sarcasm should point that out for you, no problem. I got a bib number because I was accepted onto a charity team. That, however, is entirely irrelevant. Equally irrelevant is the amount of money I have raised; but just for the record, I’ve raised over $5,500… and counting. I am proud to be an unqualified charity runner. You, an elite runner, and I, a charity runner, are one in the same in the amount of effort we put forth in preparation for this difficult event. We are one in the same in distance traveled. My 5-hour marathon finish will in no way diminish the merit of your qualified run. The pitter patter of my humble running stride will be an insignificant sound to you when you are miles ahead. So take comfort. The marathon, for you, is very much like karaoke for me. In the end, both are designed to include anyone with the determination and will to rise to the challenge. Some people do better than others, but everyone has the right to participate. The difference between you and me is that when Joe Schmo does Jimmy Buffett, I genuinely applaud his effort because I know it took a lot more guts for him to get up there than it did for me. But let’s be honest with ourselves; it takes an extraordinary person to finish a marathon, regardless of pace. So the next time you think about belittling a charity runner as you stride like a gazelle to the finish, I hope you remember what I’ve written here. Because even if I do someday qualify for Boston, I would not change being a charity runner for anything in the entire world; because I run with a full heart and not a full ego. Now go sing some Journey karaoke and get over yourself. ← Mass Mentoring. WHY I run. 16 miles. I am bummed out that “Nick-the-f*cktard” was able to create enough emotion in you to warrant an entire blog post. I don’t know that I would have done differently than you, but he doesn’t “qualify” that kind of merit. That said…nice way of spinning it. I suggest hitting up CafePress.com to make you a singlet that says “I run with a full heart, and not a full ego” on the back. Aww, well the post was more in response to a lot of negativity I have heard recently about charity runners and runners who don’t qualify. Running for charity is a beautiful thing! Kudos to you! I met you volunteering this weekend and am inspired by your progress! I consider myself a VIP member of the Chubby Joggers club! Takes a lot to get up and get the sneakers on everyday, it doesn’t come fast and easy for everyone as long as you are doing it and having fun that is all that matters! Peace be with you! Run strong come marathon Monday, don’t mind if I stalk your blog until then!